The weather has been glorious here, sunny with highs in the upper 60s and low 70s. Today, though, it’s rainy and cold again. No worries. It’s the perfect day for a hike. Off we went, my buddy Riley and me, to the Moss Rock Preserve. We had the place to ourselves, so we hiked up to the Great Wall and the waterfall. I took a couple of pictures with my iPhone. Riley and I have hiked a lot during the past couple of weeks, spending hours on old lumber trails in the Oxmoor Valley, Riley swimming in Shades Creek as it meanders its way to the Cahaba. 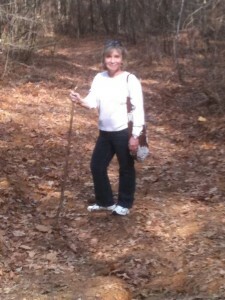 We went to Oak Mountain a couple of times, too. One of the great things about hiking in Alabama is that there are no bears. I remember a backpacking trip in North Carolina when we spent a day and night in a bear sanctuary – you know, the place where they take bears to get them a way from people. Riley loves being in the woods; it turns him into a puppy again. He likes to get ahead of me on the trail, then turn and run full speed at me, only to veer off at the last possible second. He is always so alive for the rest of the day, whenever we get out in the woods. A couple of Sundays ago, the three of us spent an afternoon walking the lumber trails, making it all the way into Bessemer before turning around. 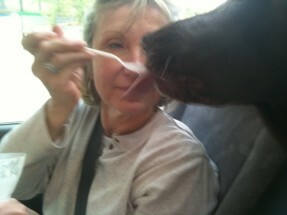 We ended the afternoon at Sonic, where Riley enjoyed a cup of vanilla ice cream. Jan fed him with a spoon.